This may be my most favorite item I've ever sewn. And it's so simple. In fact, it was a really unexciting thing to sew. A black sleeveless top. Except for the pom poms, of course. Yes, pom poms! On adult clothes. I'm a rebel. I took all of these photos the same time I took photos of my Zoe dress. And I have to say, they are all pretty terrible. I think I'm going to have to go back to the self timer if I can't figure out the focus with the remote. 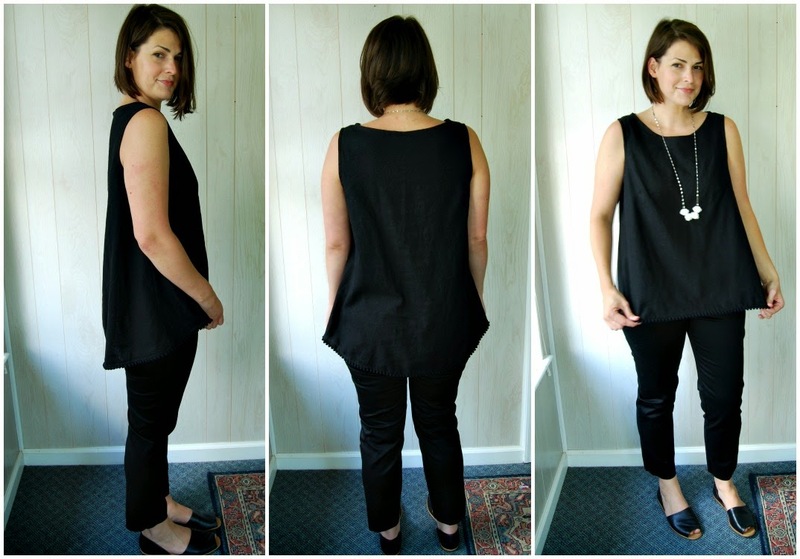 Anyway, this black linen top is another version of Simplicity 1693. Nothing much to say about it except that I absolutely love it. I eliminated the center back seam and added the pom pom trim at the hem. It has been worn once a week since I made it. It has made me think a lot about the things I sew in terms of what actually gets worn regularly. This top- check. 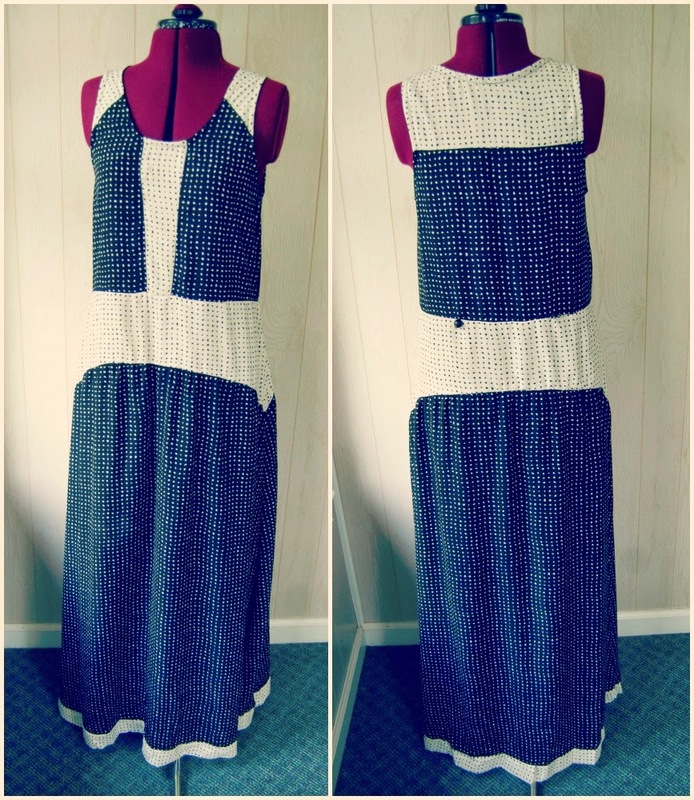 I also made a grey cotton jersey version of the Comino Cap Dress pattern by Kitschy Coo. I like it, but I don't love it. It's a simple cap sleeve bodice with an a-line skirt. I think my fabric choice makes it a little frumpy. However, it will get worn to work a lot. I added in-seam pockets which was probably a mistake. The skirt is not tight by any means. But it is also not full enough to hide the outline of the pockets. I did not use the grey jersey for the pockets by the way. 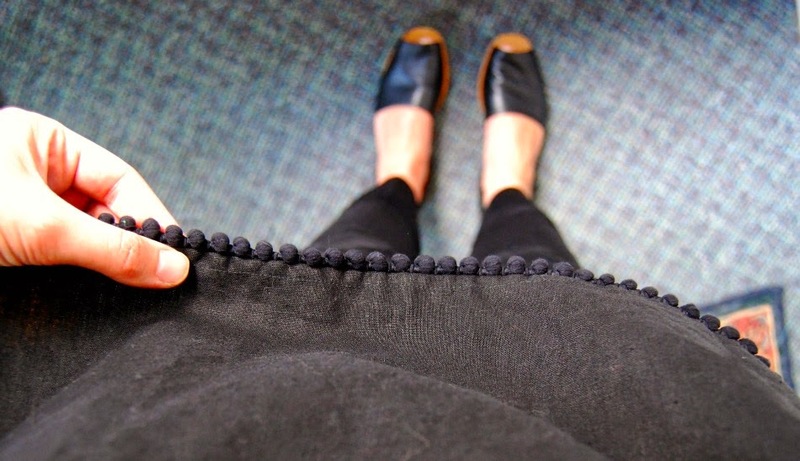 I am not a fan of knit pockets. I used a black and white striped super stretchy twill. I didn't get a photo, but you can see the stripe peeking out from the side. Which is a fun little feature. I added three inches of length since I am three inches taller than the height the pattern is drafted for. I added one inch to the bodice and two to the skirt. 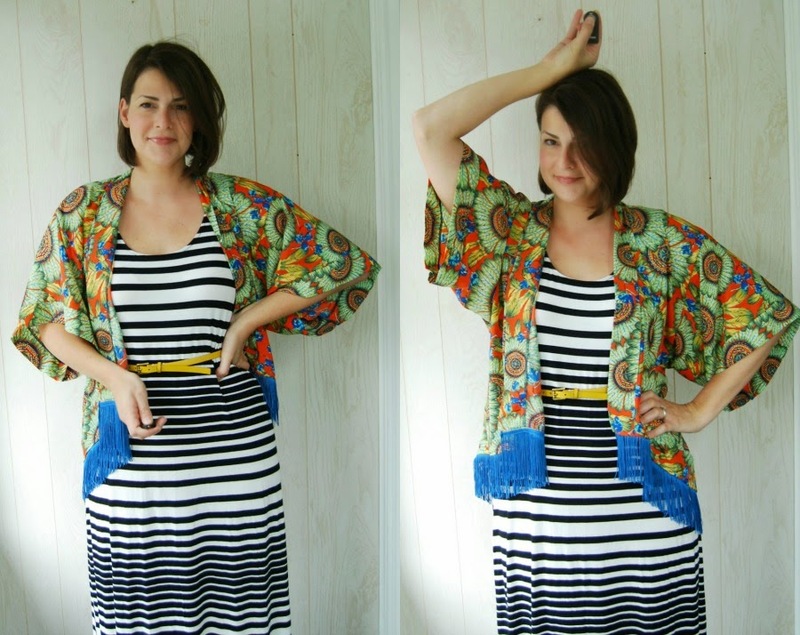 If I make this again, I'll scratch the length in the bodice and add it all in the skirt. The neckline is pretty. When I wear it to work, I will wear it with a little cardigan over it to dress it up. After I made the Comino Cap dress, I had a big piece of grey jersey left. This jersey is really thick and beefy. Really good quality stuff from Mood. My favorite kind of knit. I really wanted a jersey skirt so I pulled out my half circle skirt pattern and sewed this up in about an hour. Talk about instant gratification! Elastic waist and a slight high low hem. 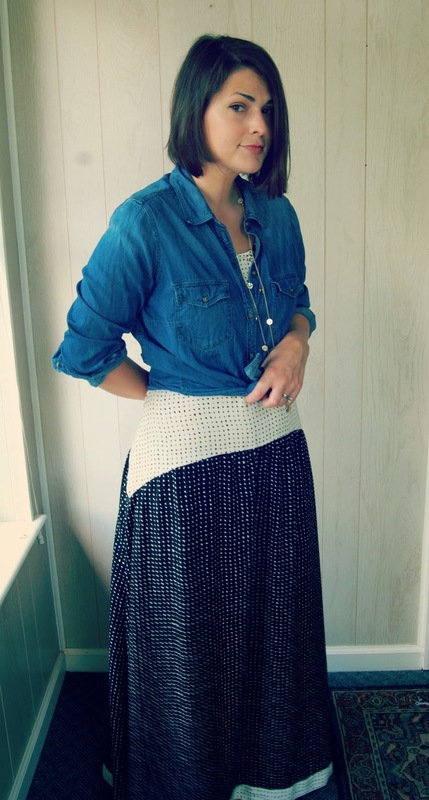 This skirt has also been worn once a week since it came off my sewing machine. Notice a theme in my color choice lately? 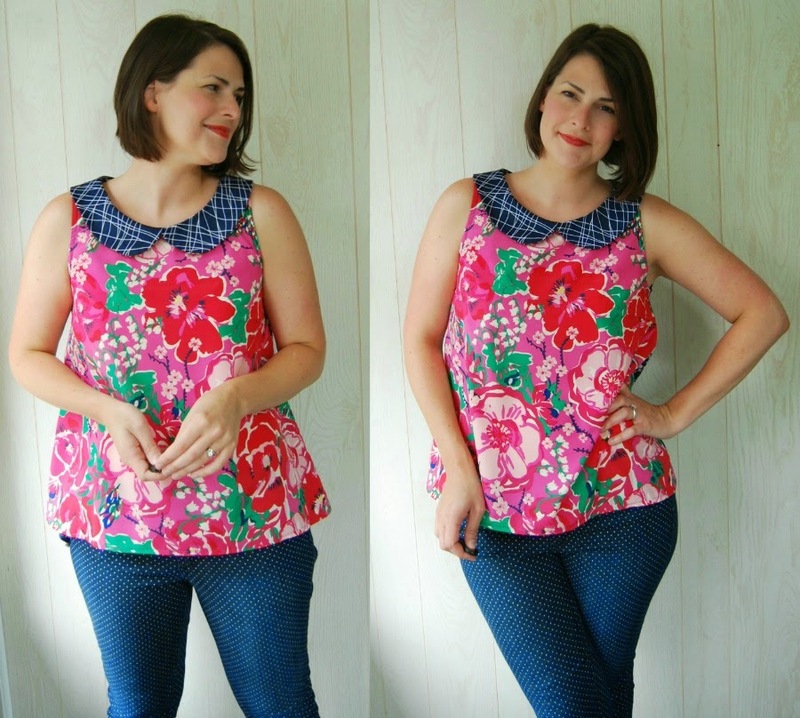 When I wrote that post about all of my duds someone suggested sewing with fabrics that work together. I know that is really just common sense advice, but it was sort of a light bulb moment for me. I make a lot things that don't work together. So I went on a small fabric buying binge (shhhh, don't tell J) and bought a bunch of black, white and grey fabrics. And you know what? It has worked. A lot of my recent makes go together and are being worn regularly. Anyway, I'll stop with all the black and white soon but it has been a nice way to beef up my wardrobe for going back to work. I really wanted this dress to work. Like really, really wanted it to. But I think this is a case of trying to fit a square peg in to a round hole. The style of this dress just does not suit me. And I knew that before I made it. I pushed on anyway. I so desperately want to be able to wear sack dresses. You know, dresses without a defined waist. I know that is not everyone's cup of tea, but I love that easy, laid back, bohemian sort of vibe. They look so cute on some. I am realizing that I really need a waistline when it comes to dresses. I can do a shapeless tunic, but not a dress. I guess maybe it has to do with length. Also, the armholes on this dress are not doing me any favors. The back of the dress has dropped armholes and a slight racer back. I seem to store nice little pouches of fat there under my arms (for winter ;) Not my favorite place to highlight. This is the Zoe dress from Tina Givens. I really enjoy her designs. But again, not everyone's cup of tea. I did have a few issues with this pattern. Most of my issues were probably a result of fabric choice. The pattern envelope stresses to use a lightweight woven, like voile. I think most of Tina Given's designs are for natural fabrics, like linen, silk and voile. I used a drape-y crepe de chine. 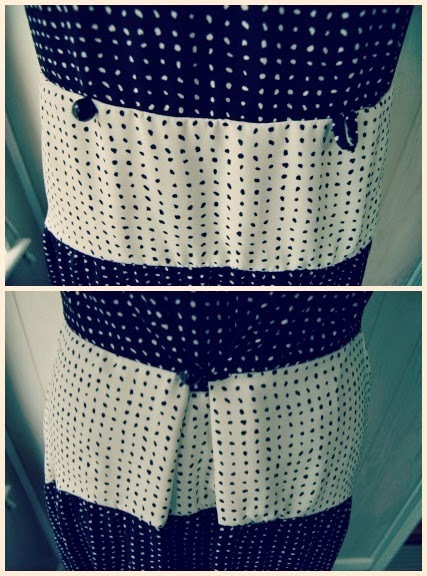 It's actually two different colors of the same print- black with ivory dots and ivory with black dots. The drape works really well, but it is heavy. 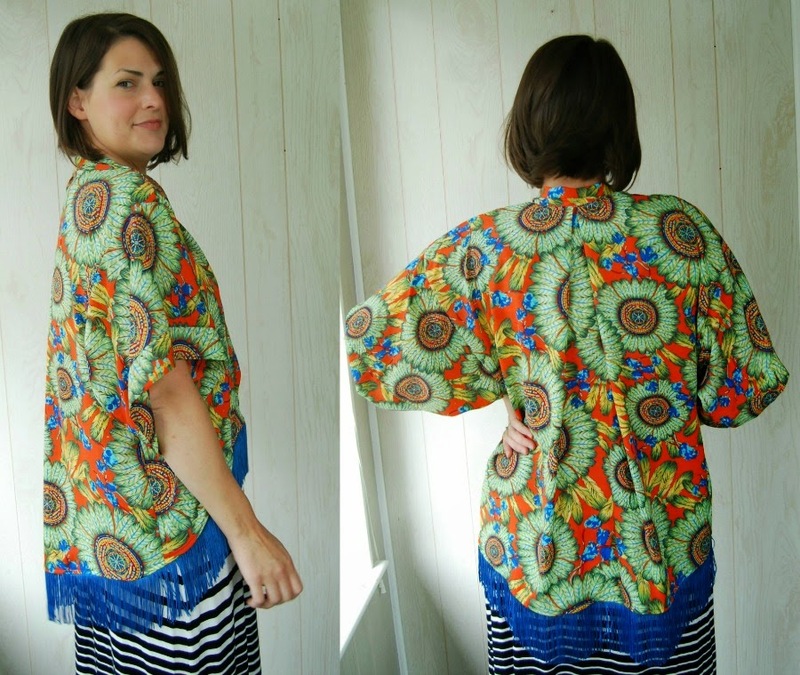 Not only did I use a heavy crepe de chine, but I also lined the whole thing with a rayon batiste. All the bodice pieces are underlined while the skirt has a free hanging lining. I had to baste the underlining in by hand because of how slippery the fabric was. It makes for a really nicely finished, but weighty dress. The weight of the fabric pulled down on the bodice so much that I had to make some adjustments. I sewed the back yoke/bodice seam in another half an inch to raise the armholes up and bit and then I chopped three (!) inches off the bodice. To be fair, I believe the pattern is supposed to have a dropped waist. But that is another design feature that does not work well for me. I really love how the pattern has a 1920's sort of vibe. It is totally different from anything I have ever sewn before. I also turned the neck and armhole bindings to the inside, just out of personal preference. I shortened the bodice so that the hip yoke piece sat around my actual hips. When I put on the finished dress, I liked it from the front. And then I turned to the side. Humph. Can't do sack dresses. See my stank face above. I was done at that point. I wasn't sure how I was going to take in the waist seam, or if I even should. I put the dress on a hanger for another day. Later that weekend, I saw a solution on someone's top out in public. It was all I could do not to stop her in Target and ask if I could examine the back of her shirt up close. She was wearing a long tunic button up shirt. But the back was cinched in with a button and a loop. Have you ever seen that before? I was inspired. 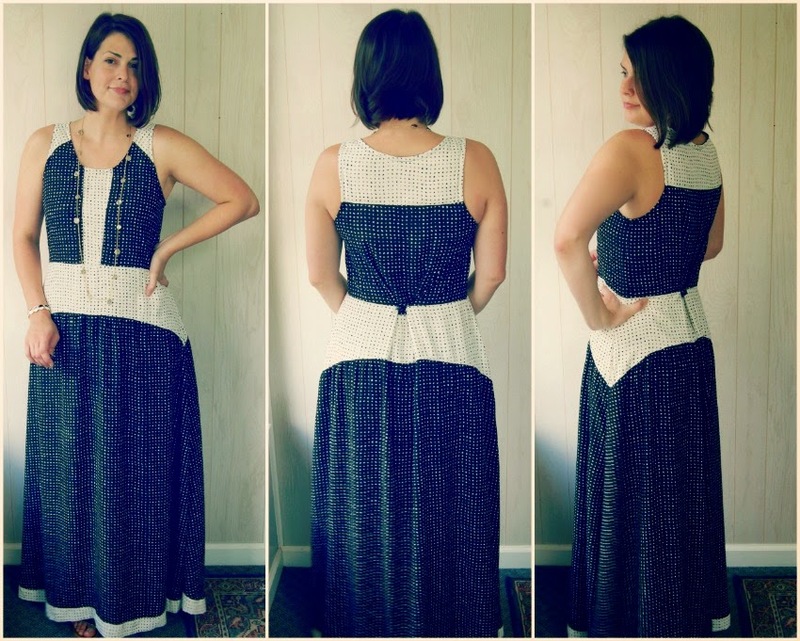 I came home and ripped out the waist seam of my Zoe dress and added a button and loop. The difference is subtle from the front, but it makes a world of difference from the side. And I could technically wear it unbuttoned if I decide I want a more shapeless look. Still not sure how I feel about it, though. The two photo collages below show the dress unbuttoned, and then buttoned. It's not a huge difference. Anyway, I'm on the fence. Other than my issues with whether or not this dress is flattering, I really liked sewing it. I love the piecing. Everything fit together perfectly, except I did need to slightly gather the skirt to make it fit the hip yoke. Just every so slightly. For now, I'll wear it with a denim shirt tied around it. Or a cardigan. And maybe I'll figure out a solution for the armholes later on. Or maybe I'll just change my mind and decide I like it as is. Definitely a pattern I want to revisit next summer in a voile like the pattern suggests. Also still haven't figured out how to hide the remote. So it becomes a prop. I knew my crazy kimono was missing something. And I actually thought about fringe. But then Oona solidified my decision with her suggestion in the comments. I shortened the hem and added the blue fringe. You better believe I love this thing now. No, it's not one of those gauzy and ethereal kimonos I envisioned. But it is fun. I still haven't figured out exactly what to wear with it. My aunt suggested some wide legged trousers. That may be something to consider in the future. For now I like it with jeans and a tank top. 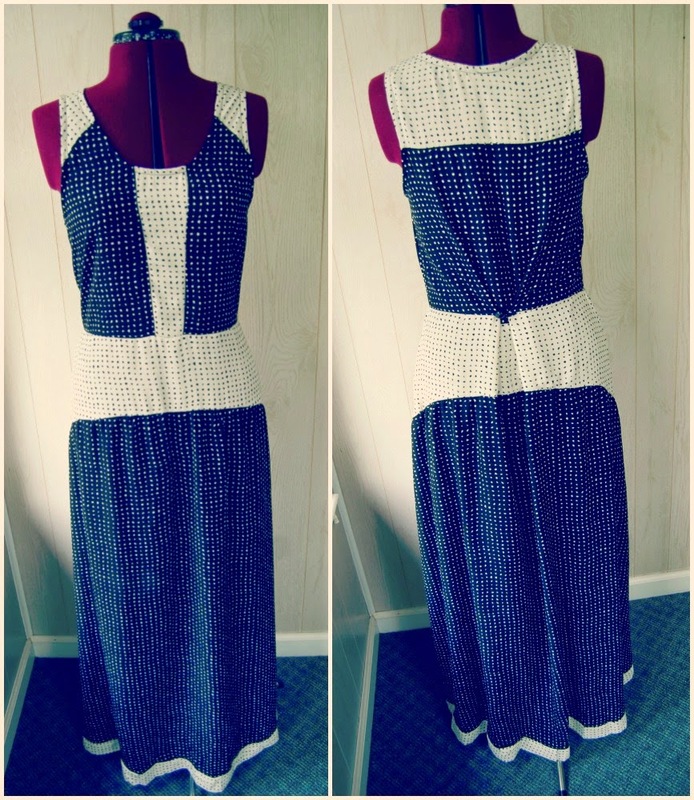 And this maxi. Arg, why am I so out of focus? I thought I figured the focus part out. Any suggestions? My other contribution for Oonapalooza is this top. It's the same pattern from my last post. I decided to go for a peter pan collar again. I think y'all boosted my confidence that it was ok. They are both growing on me. And I wanted to use three different prints. Yes, that's right. Three different prints. We all know that Oona is a master of mixing prints so I decided to take a page from her book. Although I feel like this is really safe print mixing for some reason. 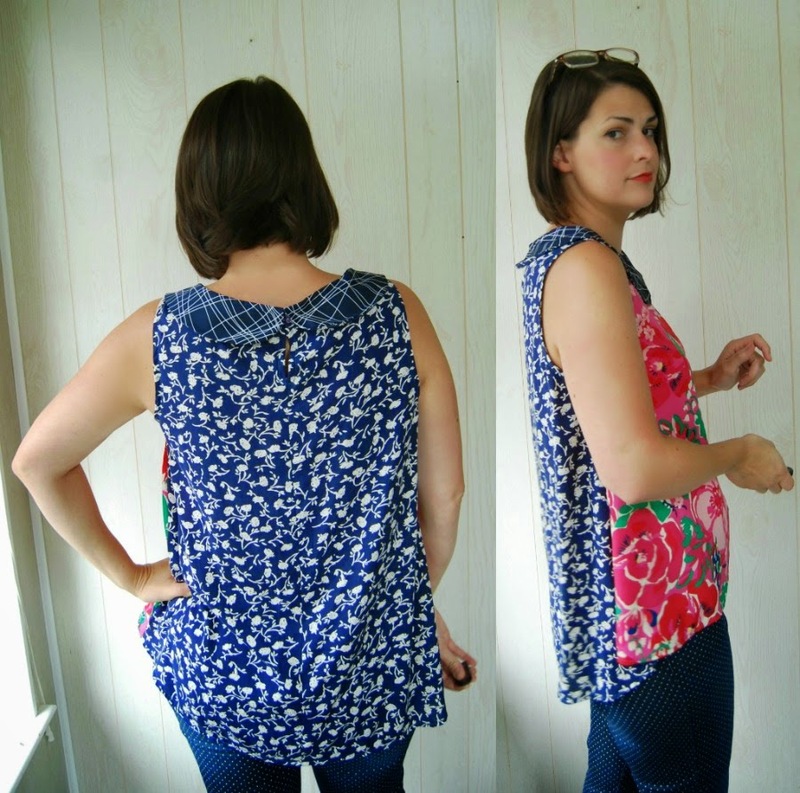 The back is that same thrifted rayon I made my first dud version from. The front is a leftover scrap from my last maternity dress. And the collar is another scrap in my stash from way back. I love it.